Click to our Duct Tape Pro Shop books page for more information. Remember that you get a free flatpack of Duck® tape with your book or video order while supplies last! Soapbox: There's a pretty good chance that the familiar holiday tradition of ringing bells and red kettles won't be heard, nor seen, outside your neighborhood mega store this season! Click here to donate to the Salvation Army online using our kettle. Trivia: In Helsinki, Finland. Do you come back to your illegally parked car to find a parking ticket? No. You come back to find a flat tire. That's how the Finnish police punish "misparkers." In Mexico City, should you have to wait long to catch a cab? Nope. They have the largest fleet in the world - 60,000! New York City by comparison has 40,000. Visit the Duct Tape Pro Shop and check out the Holiday Trilogy pack deal. Get our second and third books (autographed of course) with our video, a bumper sticker, and a flat pack of Duck® brand duct tape. This deal is worth over $28 for just $15! It's beginning to look a lot like duct tape! The holidays are no time to forget about duct tape - especially now with all of the color available, it comes in handier than ever for decorating, gift wrapping (for the gift that says, "open me eventually"), cleaning, even gift creation (check out our make-it-yourself page). 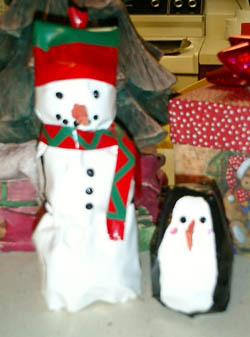 Stephanie made these winter decorations out of duct tape. No instructions needed, just get out your tape and start messin' around with it. Eventually, you will have created the ultimate conversation piece for your holiday party. Hear the worst rendition of Oh, Holy Night ever recorded. Click here (we recommend emptying your bladder first). Gift ideas for your Duct Tape Pro! Visit our new and improved Duct Tape Pro Shop to see all of the new stuff that we have in store. Of course our famous t-shirts, but now sweats, boxers, caps, flying discs, mugs, license plate frames, and a ton of other stuff. 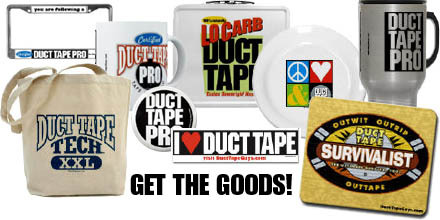 Here are just a few of the items that you will find at the new Duct Tape Pro Shop (just in time for holiday gifting). 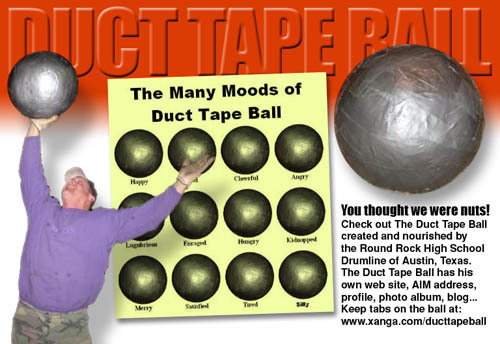 Click to xanga.com/ducttapeball for more information and laughs. Yesterday, I saw a really neat duct tape usage in the medical records office at a local hospital (Bon Secours Hospital in Port Jervis, NY) The late afternoon sun beats-in relentessly on the girls in the medical records office and management doesn't seem to care enough to get them some drapes or curtains or a shade. So...they got a white hospital blanket...and taped-it-up on the window... creating a design at the top using gradient descending pieces of duct tape. The they created pull-bags with the duct tape to create a draping. C-L-E-V-E-R. See you in the next duct tape journals. 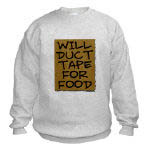 --- Diane/Milford, Pa.
Our newest design is "Will Duct Tape for Food" - our hottest seller since we switched t-shrit vendors to CafePress. Available as t-shirts (men's and women's), baseball jerseys and sweats (regular or hooded). Click to the Duct Tape Pro Shop's apparel store. These make GREAT CHRISTMAS GIFTS! Humor for your family holiday gatherings (depending on your family). "Read it?" the Polish guy replies, "I know the guy. "I have a crazy neighbor who's half Swedish and half Japanese. 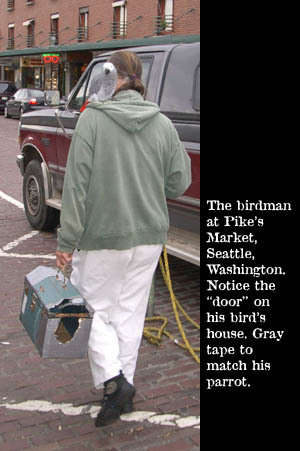 Every December 12th he attacks Pearl Olson." Bubba was from Alabama and was, a hard-shell Southern Baptist. He loved to sneak away to the race track. One day he was there betting on the ponies and losing his shirt when he noticed a priest step out onto the track and bless he forehead of one of the horses lining up for the 4th race. Lo and behold, this horse - a very long shot - won the race. Bubba was most interested to see what the priest did in the next race. Sure enough, he watched the priest step out onto the track as the horses for the fifth race lined up, and placed a blessing on the forehead of one of the horses. Bubba made a beeline for the window and placed a small bet on the horse. Again, even though another long shot, the horse the priest had blessed won the race. Bubba collected his winning and anxiously waited to see which horse the priest bestowed his blessing on for the 6th race. The priest showed, blessed a horse, Bubba bet on it, and it won! Bubba was elated! As the day went on, the priest continued blessing one of the horses, and it always came in first. Bubba began to pull in some serious money, and by the last race, he knew his wildest dreams were going to come true. He made a quick stop at the ATM, withdrew big money and awaited the priest's blessing that would tell him which horse to bet on. True to his pattern, the priest stepped out onto the track before the last race and blessed the forehead, eyes, ears and hooves of one of the horses. Bubba bet every cent, and watched the horse come in dead last. He was dumbfounded. He made his way to the track and when he found the priest. He demanded, "What happened, Father? All day you blessed horses and they won. The last race, you blessed a horse and he lost. Now I've lost my savings, thanks to you!!" The priest nodded wisely and said, "That's the problem with you Protestants... .you can't tell the difference between a simple blessing and the Last Rites." 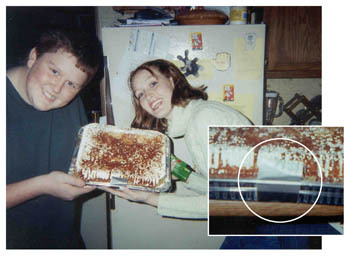 If you spot duct tape - snap a photo and send it to us. We'll add it to our Duct Tape Sightings pages. 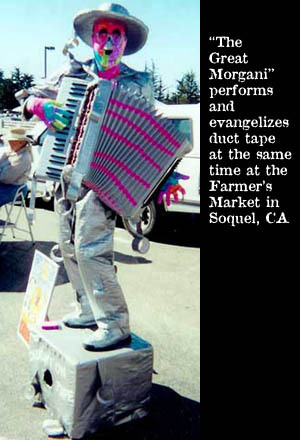 RANDOM WINNER: The random winner of a duct tape book in this issue: Kerry Orvis - Congratulations! 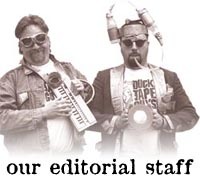 Email us your postal mailing address and we will send you an autographed Duct Tape Book.